Snelsmore Common country park is a SSSI-designated nature reserve of about 100 hectares, managed by BBOWT. It comprises one of the larger areas of lowland heath in the county, with associated valley mires and bogs, and has been managed to remove woodland which encroached after traditional common grazing ceased in the 20th century. The site is now actively managed to control bracken and encourage heather and gorse. As well as heathland birds, a wide range of other fauna and flora typical of heaths can be found, such as Bog Bean, Sundew, Bog Asphodel, and White Admiral and Purple Emperor butterflies. 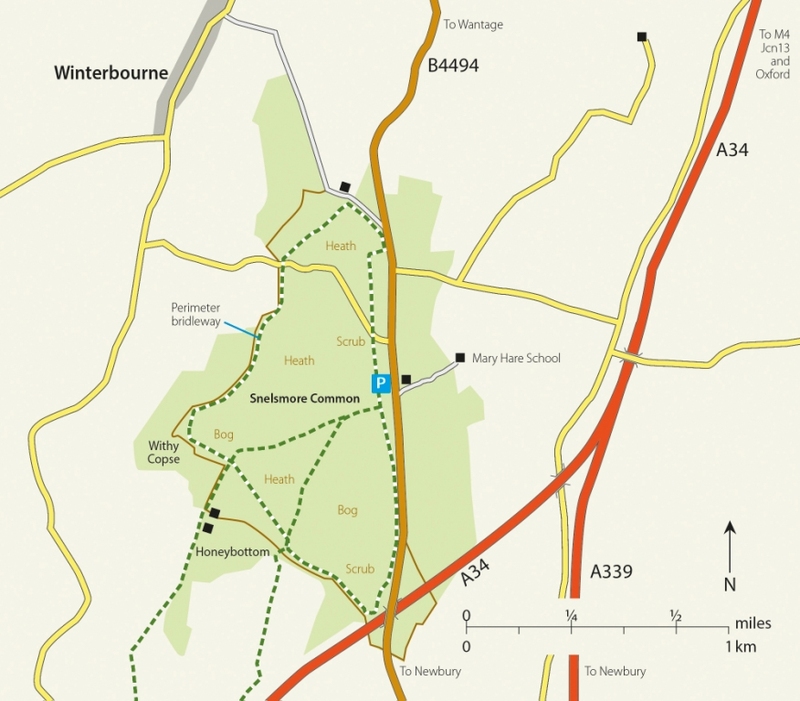 Access: The car park and picnic area is 2½ miles north of Newbury on the B4494 Wantage Road, (SU 463 713). The site is crossed by footpaths and tracks, whilst a bridleway encircles the outer edge. There is a car park, toilets and picnic area. Resident: Sparrowhawk, Kestrel, Collared Dove, Tawny Owl, potential for all three woodpeckers, Goldcrest, Nuthatch, Treecreeper, Jays, Yellowhammer or Reed Bunting. Summer: Hobby, Woodcock, Nightjar, Cuckoo, Chiffchaff, Willow Warbler, Whitethroat, Blackcap Garden Warbler, Nightingale, Tree Pipit, Linnet. Wood Warbler no longer breed but are occasionally recorded on passage. Winter: Winter thrushes, Siskins and Lesser Redpolls. Crossbills occasional, Stonechat possible.